The first installment of the popular series of three-dimensional brawls created by Team Ninja studio. A special feature of the title is the simplified control in relation to other representatives of the species, which focuses primarily on the speed and use of counter-attacks. Released on the PS1 platform, Dear or Alive is the first installment of one of the most popular series of three-dimensional beats. Created by Team Ninja studio, the production was originally released in 1995 on slot machines, and in the following years the ports for the Sega Saturn and PlayStation consoles will be available. The great financial success of the game saved its publisher, Tecmo, from bankruptcy. The Dead or Alive combat system on PS1 is strongly inspired by another popular representative of the genre, Virtua Fighter. However, Team Ninja employees were tempted to introduce solutions that distinguish their work from the competition. Although the essence of the game is one-on-one duels between characteristic warriors, the production focuses primarily on speed, giving the player little time to react to the opponent's actions. Control is simplified in comparison to other battles, but a smaller number of possible attacks is compensated for by a highly developed system of counterattacks. A special feature of Dead or Alive is the construction of the arenas. Outside the battlefield there are so-called danger zones (Danger Zones). An inattentive warrior can be easily fired into the air, giving his opponent the chance to make a deadly combination of attacks. Eleven characters were made available to the players, two of which made their debut only in the console version of the game. 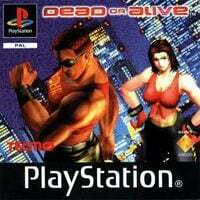 At the time of its debut, the Dead or Alive visuals on PS1 were impressive and it was one of the best-looking representatives of the genre on the market. The title became particularly famous thanks to the high quality models of female warriors and the possibility of activating a special mode, in which women's breasts waved during the clash.